We love Grants' new book which will be on sale in June. Grant is a terrific writer of books you just can't put down. The humor, pathos and drama captivates you from the beginning. We can all identify with, or know the people who live within the pages of his books. This is book that you'll thoroughly enjoy! 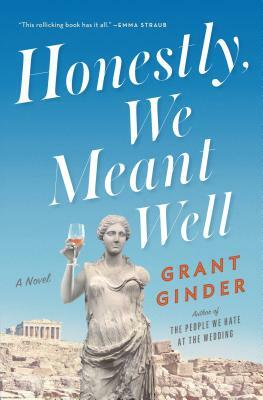 "Smart, funny, and filled with delightfully effed-up characters, Honestly, We Meant Well shows us once again that Grant Ginder is a master of simultaneously loving and filleting people who mean well but, let's face it, aren't doing so well with the big questions of life." "Grant Ginder writes characters I want to be and characters I'm terrified I might already be. He deeply understands the agonizing and beautiful parts of being a person in relation to other people, and in the deftly woven Honestly, We Meant Well, Ginder highlights both the agony and the beauty of family. It's also hilarious." "Reliably entertaining and intelligent, Ginder is an excellent tour guide for both the sunny Greek islands and the darker channels of the human heart."